Digicel PNG has come on board the 2016 Morobe Open as a major sponsor, pledging K50,000 to the golf tournament which will run from April 14 to 17 at the Lae Golf Club. Digicel General Manager Momase Region, Mirza Baig said Digicel is thrilled to partner with the Lae Golf Club to support the Morobe Open. “Digicel is proud to be a part of this year’s Morobe Open which provides a great opportunity to showcase the talent of our PNG golfers and also host international pro golfers,” he said. Mirza Baig presented the dummy cheque to the Lae Golf Club President Phil Hommelhoff at a media presentation today at the club. Morobe Open organizers are set to put on a professional tournament ensuring a successful and entertaining event. 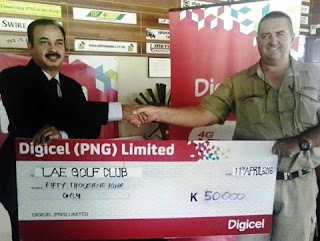 Photo 1 - Digicel General Manager Momase Region, Mirza Baig presenting the dummy cheque to Lae Golf Club President Phil Hommelhoff at the Lae Golf Club.